Justin Bieber, who has reportedly become born again and has been preaching Jesus to his crew members, recently took his evangelism to the Kardashian family by taking Kourtney to church. Last night, the rumoured former flames were seen arriving a Los Angeles church at the same time, for evening prayers. For the religious outing, mother-of-three, Kourtney, wore a sheer top that showed off her black bra beneath. She also had on a leather aviator jacket on top of her blouse but made no effort to try to conceal her bra with the jacket which was left hanging open. Rumours began to circulate that Kourtney and Justin were in a romantic relationship after the pair were caught cuddling late one night in early 2016. Justin joked off the rumors while Kourtney insisted that they were just friends. 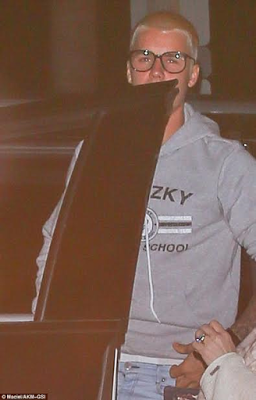 Since her split from her partner, Scott Disick, Kourtney and Justin have become closer again and were spotted earlier in the year as they enjoyed a night out in each other's company.